On June 10th, His Excellency Mr. Bakiyev, the President of Kirghizian visited SINOMACH accompanied by Mr. Zhang Yannian, Chinese ambassador to Kirghizian and Mr. Ren Hongbin, President of SINOMACH. To greet the delegation led by President Bakiyev, a special Exhibition of SINOMACH Achievements was arranged by CNAICO in the lobby of the first floor in SINOMACH Building. In the company of the host team and more than 10 distinguished Kirghizian guests including the First acting Vice Premier, Minister of Foreign Affairs and other important government officials, President Bakiyev toured the exhibiton site with interest. 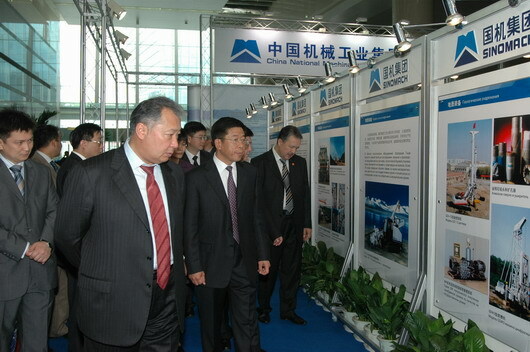 Mr. Liu Bing, Assistant President of SINOMACH, leaders of the relevant departments and offices in SINOMACH headquarters and other Chinese and foreign guests were also present at the exhibition. This exhibition is a special event held to greet President Bakiyev. CNAICO was designated the organizer of it. Upon acceptance of the task from SINOMACH, the whole company from top to bottom has attached great importance to it. President Liu Jingzhen has repeatedly instructed the PR & Planning Department and Design and Production Department to do their utmost to guarantee the accomplishment of this task. Vice President Lin Hailin personally supervised the working peocess. In less than two weeks, all the works such as scheme planning, sample design, production, site layout and dismantling have been accomplished. As pre-scheduled, the special exhibition was successfully held on June 10, gaining recognition of both foreign and Chinese guests, especially the leaders of SINAOMACH.